TINA, one of the world’s most advanced web-based ERP systems for the travel industry, aims to maximize office management and systems with an eye toward increasing efficiency and productivity. TINA Travel IntraNet Application is an ERP (Enterprise Resource Planning) specially designed to help travel professionals manage their workflow. TINA handles all bookings, client and supplier invoices, payments and settlements. TINA integrates bookings made inside 3rd party applications (such as GDS, hotel wholesalers, Airlines, etc.) through its 3rd party XML import feature. This way, you can process orders and paperwork in a way that works best for you and your travel agency. TINA gives you the tools to strenghten office management: automated customer profiles, task management, sales force management module, automated reporting, dashboard reporting, calendar functions, automated alerts, credit limit management, user traces for the identification of patterns inside the daily workflow and many more. TINA offers reliable reporting tools - standard reports, customized reports, dashboard and interactive reporting, and specialized reports for 3rd parties. You can use a standard form or create your own customized reporting system. TINA also enables you to generate automated reports, in several formats. TINA combines historical data, real-time data, including salesforce automation; it enables you to have access to your complete database. TINA's data mining and business intelligence algorithms make it the best tool for business forecasting. You can see TINA as the software translation of the travel agent day to day operations. 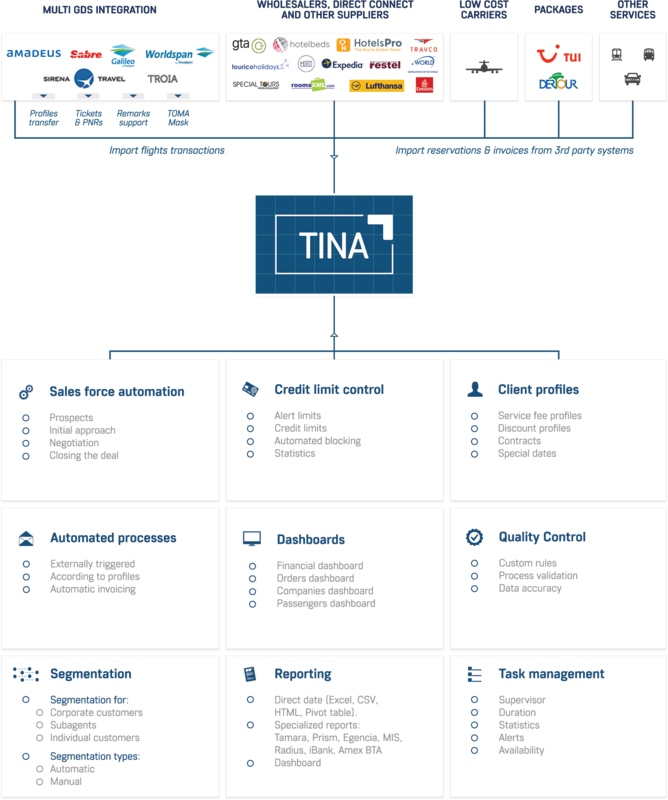 TINA ERP is a very well designed software tool that is able to accommodate virtually any business model, to increase its efficiency and to remodel it in order to achieve the result you desire. We want to offer you an end-to-end experience, so we created all dcs plus products interconnected. This way, you can manage your sales process and generate any report in TINA, you can create and manage your own inventory in AIDA, you can aggregate and distribute travel content from your own inventory as well as GDS's and Wholesalers in IRIX. You can use TRIP to sell all this content to your online customers.